William WOOD, The Winning of Canada. A Chronicle of Wolfe, Toronto, Glasgow, Brooke & Company, 1915, 152p. Chapter 1. The Boy, pp. 1-9. Chapter 2. The Young Soldier, 1741-1748, pp. 10-27. Chapter 3. The Seven Years' Peace, 1748-1755, pp. 28-42. Chapter 4. The Seven Years' War, 1756-1763, pp. 43-51. Chapter 5. Louisbourg, 1758, pp. 52-66. Chapter 6. Quebec, 1759, pp. 67-98. Chapter 7. The Plains of Abrahams, September 13, 1759, pp. 99-139. Chapter 8. Epilogue - The Last Stand, pp. 140-145. 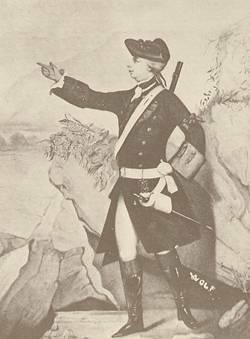 For a critical evaluation of the military role of James Wolfe, consult the presidential address to the Canadian Historical Association  made by E. R. Adair. This address is entitled "The Military Reputation of Major-General James Wolfe".